So happy I went to Dr Chacko. He is opened to alternative ways to help with my pain. Compassionate honest and informative. The staff is professional but down to earth. . I am thrilled that I went to see Dr. Chacko. He was easy to talk to, seemed genuinely interested in my issue and was very knowledgeable. I am confident that he is helping me get back on the road to good health. His staff was also very pleasant and friendly. So happy with my visit. Dr. Chacko has a great bedside manner and is very knowledgeable. 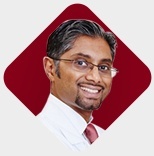 Dr Chacko is a very personable, caring and easy doctor to talk to. I had no waiting time for my visit, I was called promptly at the time of my appointment. His staff is very pleasant and extremely helpful. I would definitely recommend him. Finishing up treatment over the next few weeks for my neck and back. Dr. Chacko is an attentive Dr. who is competent and understanding. The pain management I have received from his staff has been great. The acupuncture with Ryan is great as well!